Click here to learn more about Gotta Groove Records and our processes. TO PLACE AN ORDER, PLEASE COMPLETE AND SUBMIT THE ORDER FORM BELOW. If you run into any issues or have questions before placing an order, please contact us at (800) 295-0171 or sales@gottagrooverecords.com . Is this your first time making a record? Please pick the items below that you want to add to your order. For anything that you don't want, just skip that item and move on. BASIC LABELS (Please refer to http://gottagrooverecords.com/record-labels/ understand what this means). *3-step plating is the default for all 180 gram orders of 500 or more records. This is the number/letter combination that will be scribed into the deadwax area of the record next to the label. There are no real requirements/limitations, other than it needs to be unique (so, no "001" or something too simple). If you cannot think of anything, just type "please assign" and we will set the matrix number for you. Also, if there is any additional text you want scribed into the leadout, this is where to put this information (just keep in mind the area is small). VERY IMPORTANT: If you are supplying lacquers, it is extremely important that what you type here matches precisely what your lacquer engineer is scribing into the lacquers. SINGLE RECORD PACKAGE DOUBLE RECORD SET TRIPLE RECORD SET (I am not ordering any records). Note: Must be 200 copies or more when supplying lacquers from a third party. GGR is cutting my lacquers for me (most common selection) I am supplying lacquers from a third party. If you don't know what this means, in a very basic nutshell, lacquers are the first step in transferring your audio files to vinyl. GGR cuts lacquers in-house on over 90% of the records we press. For folks supplying lacquers from a third party, it is EXTREMELY important you place your order BEFORE your lacquers are cut, and that you ask your engineer to contact us BEFORE they ship any lacquers out. While you can supply your audio files as individual tracks if need be, it is strongly preferred that they be supplied as single high resolution files for each side of the record, with an accompanying timelog showing the start and end times of each track calculated from the beginning of EACH side (i.e., side B timelog starts over at 0:00:00). If you are supplying audio files as individual tracks, be sure to list the tracks by the exact same names as the file names you are supplying, in proper order, and indicating which tracks are on which side of the record. 33 45 I am not ordering any records. Note there are sound quality issues when cutting 7inch records at 33rpm. Please inquire. TEST CUTS SENT VIA EMAIL (12" ONLY - NOT AVAILABLE ON 7INCH) (see description below) FULL REFERENCE DISCS CUT AND SENT TO ME I DECLINE ANY REFERENCE CUTS, AND I UNDERSTAND PROGRAM MATERIAL SOUND ISSUES DETECTED IN TEST PRESSINGS ARE MY OWN LIABILITY AND ADDITIONAL COST TO CHANGE. NOT APPLICABLE - I AM SUPPLYING LACQUERS. STRONGLY RECOMMENDED FOR ALL 12 INCH ORDERS! MORE INFORMATION (PLEASE READ): Reference cuts happen before master lacquers are cut -- they are intended to be a "preview" of what the source material will sound like on a pressed record. Traditionally, every release produced on vinyl would have full reference discs cut and sent out for approval before master lacquers are cut. In "modern times", many people do not factor the costs of reference discs into their budget. Therefore, in the interest of avoiding mastering issues on test pressings but also saving customers money, GGR developed a procedure where we cut samples of your audio (not the entire program) into a lacquer, which is then recorded on a turntable and emailed to you for approval. Of course, if your budget and timeline permits, we would recommend doing full reference discs over test cuts via email in general; but test cuts are a much better alternative to doing no reference cut at all. To be clear - reference cuts are NOT a replacement for test pressings - they happen several steps before test pressings, and serve the primary purpose of checking mastering considerations before getting all the way to test pressings. (Making changes to mastering after test pressings have been made adds considerable additional costs and delays to a record order). All first pressing orders will receive 5 test pressings by default. Test cuts via email are $40 (for a single record package) or $80 (for a double record package). Full reference discs are $85 per side for a 12" cut; or $65 per side for a 7" cut. PLEASE READ: Click here to review the GGR Art Guide. Please select. BASIC LABELS (INCLUDED at no extra charge) Full color (extra charge) Silver or gold w/black backdrop (extra charge) Black on silver or gold backdrop (extra charge) Silver or gold with color print (extra charge) Plain white labels (no extra charge) Plain black labels (no extra charge) NO LABELS - one side only (extra charge) NO LABELS - both sides (extra charge) Not sure yet - just add any additional charges to my order once artwork is complete. Please refer to http://gottagrooverecords.com/record-labels/ to make sure you understand what “BASIC LABELS” means. You can upgrade to either Full Color (CMYK), Black and Silver, or Black and Gold labels for $100 per 1,000 records ($100 minimum). For other options, please contact us before preparing your art. NO LABEL RECORDS: there is an additional charge of $0.30ea for each record when there is no label on one or both sides of the record. Also, please note that such records tend to be slightly dished and/or have slightly malformed center holes. No-label records are NOT available on 180 gram records. If you want standard white paper innersleeves, just skip this field. Otherwise, please indicate the upgrade option you want (white polylined, black polylined, printed innersleeves, etc). If you are ordering printed innersleeves, please let us know whether B&W or Full Color (CMYK) print. PLEASE NOTE: cardstock innersleeves are NOT recommended, and therefore are not listed on our price grids -- they cause surface scratches to the records, which over time, will cause sound issues on the records. Please tell us what type of jacket you are ordering (e.g., "Single pocket standard jackets", "Gatefold jackets", etc). Please indicate B&W, Full Color (CMYK) print, or any other special color or foil stamp options. Tell us if you want any special finishes (the standard finish is gloss). For Tip-On jackets, tell us if you want matte or gloss lamination, and chipboard or white cores. If you are supplying jackets from a third party, please tell us here (insertion fees apply when jackets are supplied by third parties, but not when GGR is printing the jackets). If you are not ordering any jackets, please skip this field. Tell us about anything else that is going into your package here -- lyric sheets, booklets, posters, supplied cd's, etc. Either if we are printing other items for you, or if you are supplying other items to us for insertion, this is where to tell us. It is extremely important that we have a complete bill of materials listed so that there are no mistakes in processing your order. 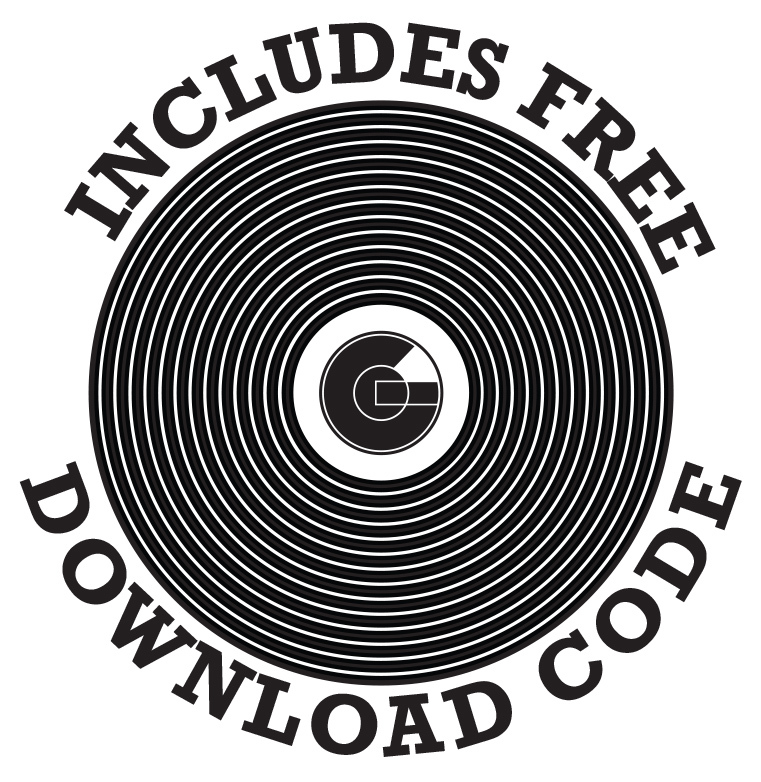 GGR hosts downloads as an add-on item -- our standard package includes hosting, a coupon with a thumbnail of your cover art printed on it, a unique landing page for your release, and our stock generic "FREE DOWNLOAD INCLUDED" sticker -- please see below for examples on these items. If you are supplying downloads from a third party, please tell us here -- cost is $0.06ea for us to insert downloads supplied by third parties. Click here for an example of the landing page we set up for your release -- you supply a custom 480px wide x 100px tall for the top. We can host both an mp3 version and a high-resolution version of the audio. Please Select. Shrinkwrap ($0.20ea) Polybags - I'll stuff myself ($0.20ea for 12" / $0.10ea for 7inch) Stuffed into polybags (GGR full assembles) ($0.35ea for 12" / $0.20ea for 7") Resealable polybags - I'll stuff myself ($0.25ea, only available on 12") Sealed into resealable polybags - 12" only ($0.55ea) No wrap PLEASE NOTE FOR ORDERS INCLUDING JACKETS: We strongly recommend that you either shrinkwrap or have us polybag your records. Shipping records in jackets without some type of wrap causes the jackets to rub against each other in transit, and can cause surface scratches and ink smudges on the jacket faces. The only way to avoid this is to shrinkwrap or polybag the jackets. GGR CANNOT OFFER ANY RECOMPENSE FOR JACKETS DAMAGED IN TRANSIT DUE TO LACK OF SHRINKWRAP OR POLYBAGGING. PLEASE NOTE FOR ORDERS SHIPPED WITHOUT JACKETS: When shipping in plain paper sleeves with diecut holes, the label faces on each record will rub against each other in transit, causing surface scratches and ink blemishes on the labels. This does not affect record playback, but can affect the appearance of the record labels. The only way to prevent this is to ship records in polylined innersleeves (only available for 12″ records) and/or ship records in jackets. GGR CANNOT OFFER ANY RECOMPENSE FOR MARKS ON LABELS CAUSED IN TRANSIT. These issues regarding jackets/labels rubbing against each other in transit are rarely brought to our attention. However, since we are aware of the potential for these issues due to a handful of reports over the years, we feel compelled to at least bring them to your attention when you are setting up your order. Unfortunately, carrier insurance does not cover the costs of replacing records and/or jackets due to these issues. Leave blank if you are not ordering stickers. Otherwise, please do your best to fully describe the size / shape / colors of the sticker and we will quote the price to you. Leave blank if you will not have any sticker on the outer wrap of your record. Otherwise, please tell us where you want the stickers placed. 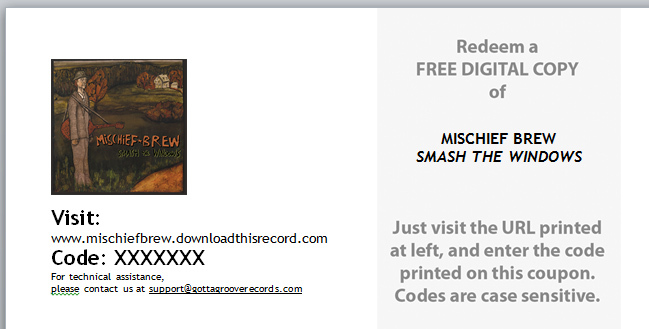 There is no charge to place GGR Download stickers onto shrinkwrap when purchasing our download package deals. Otherwise, the cost to apply a single machineable sticker to shrinkwrap is $0.10ea, and to polybags $0.15ea. Additional sticker application is $0.15ea. Clear stock stickers cost $0.25ea to apply. Hand-applied stickers (non-machinable stickers) vary depending upon the specs. No. Yes - add $39. If you order a bar code, we will supply you with a graphic that you can embed into your jacket art. You get 5 test pressings by default. Extra test pressing costs are as follows: $3each for standard weight 12" vinyl | $5each for 180 gram 12" vinyl | $2each for 7inch vinyl. NO YES Carrier provided insurance covers visible damage to shipping cartons. In the case of filing a damage claim, you must keep the shipping cartons until the claim is complete, or the claim will be denied by the respective carriers. When a claim is honored, the carriers insure only the manufactured value of the goods - not the retail or wholesale value. All orders ship F.O.B. Gotta Groove Records, Cleveland, Ohio -- this means that the risk of damage/loss shifts to the customer (you) once the packages are picked up from the GGR pressing plant. Cost for insurance varies depending upon the quantity of the order, but is rarely more than $30-50 for orders up to 2,000 records. NO YES All orders are double boxed by default. You can opt for triple boxing for $5 per carton. SHIP my used stampers and extra print back to me with my order. DISCARD my used stampers and any extra print. GGR will store mothers for at least three years. Otherwise, GGR does not store any customer parts, and parts left at GGR premises will be discarded within 30 days of order shipment. Please note -- on smaller quantity orders (under 500 records), there are often leftover print parts far in excess of the order quantity. These will be shipped back to you by default, so if you do not want them, please be sure to speak with a GGR representative about them before your order ships. Please be sure to review everything you have entered above, and once complete, click the button below to submit your order. Within 1 business day (and usually the same day you submit your order), you will receive an order confirmation email from a GGR representative. This email will confirm the specs of your order, as well as all pricing. You will also receive a job number, instructions on uploading your files, and instructions regarding payment options.